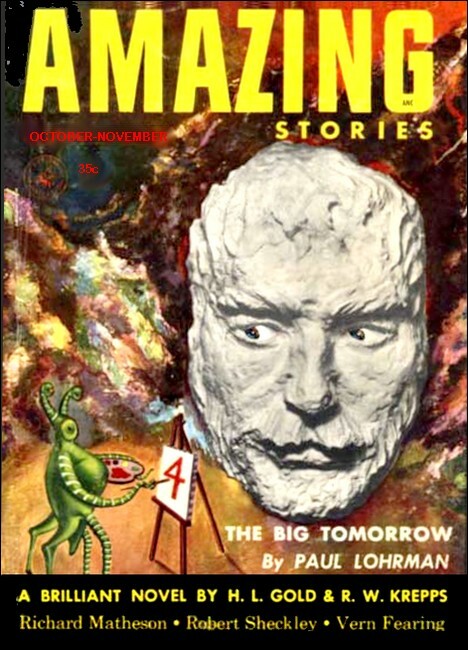 Amazing Stories, October 1953, with "The Sloths of Kruvny"
This world we live in is a pretty grim place. It's tough to make a living. At any moment we may get blown up, down or sideways by the atom bomb. The day after tomorrow may never come, and on top of all this, TV commercials are getting worse and worse. It seems that our only salvation is a sense of humor, so we give you "The Sloths..." a very unserious yarn. BRADLEY BROADSHOULDERS—friends called him "Brad", or "Broad", or "Shoulders"—stood grim-lipped, as is the custom of spacemen, and waited for the Commander to speak fateful words. He was an obese youth, fully five feet tall, without a shred of muscle, but he wore the green tunic of the Galaxy Patrol proudly, and his handsome, bony head boasted a tidy crop of Venusian fungus. His gleaming eyes gleamed. "Brad, We Are In A Tough Fix!" the Commander said suddenly. His name was Metternich, known also as Foxey Gran'pa; he had spoken in capitals all over Europe and continued the practice since. "We Are Up Against It!" he went on. "The Fate Of The World May Be At Stake!" "What's wrong, chief?" asked Brad, jauntily. "Plenty!" roared Metternich. "Nobody's Attacking The Earth— That's What's Wrong! Nobody Is Out To Conquer The Universe! How Come, May I Ask?" Brad gulped. Could he believe his ears? No one attacking good, kind, old Earth? Was there nothing in which a man could pin his faith, let alone his ears? Were they, indeed, his ears? He turned to his best friend, Ugh, who stood beside him. Would he stand behind him? Did he realize they were on the verge of A Mission? Ugh was a pastiche, or intermezzo—a cross between a Martian and a Texan—as loathsome and stupid a combination as one could wish. Why he was Brad's best friend was a mystery. Squarely, he met Brad's gaze, which left him an eye to spare. It winked, and Brad shuddered. "I Want To Know Why!" the Commander shouted. "You Have Your Secret Orders! Off With You!" The good ship, Lox Wing, was almost ready to go. She was a fine, spaceworthy craft, Brad knew; just the same, it was disconcerting to see rats deserting her by the thousands. Not that he missed them; some were sure to return as soon as Ugh appeared on the scene; he seemed to fascinate them. Just then, the rats paused. Sure enough, Ugh was coming. He was reeling. He had apparently made the rounds, as is the custom of spacemen, swilling vast quantities of airplane dope, and he was high as a kite. Brad glommed him glumly in the gloaming, with more than a glimmer of gloomy foreboding. It was wrong, he thought, all wrong. If only it hadn't been too late to turn back. But it wasn't. They hadn't even started yet. If anything, it was too early. There was no way out. He entered the spaceship with a Si. Si, whose whole name was Silas Mariner, shook his hand weakly, muttered: "Remember the Albatross!" and tottered out. Presently, Brad and Ugh were blasting off. As the cigar-shaped vessel rose to the starry void, spacemen, their visages lined and tanned like cigars, held their cigars aloft in silent salute and gently flicked their ashes, while softly, a cigar band played "Maracas, Why You No Love Me No More?" Two days out, Brad summoned Ugh. "How fast are we going?" "Oh, say... 30,000 miles an hour?" Brad calculated rapidly and put down his abacus. "At this rate it'll take us 14 years just to get out of our own lousy solar system!" he barked. "Faster!" Ugh said Yes, Sir, and vice versa. Then he upped the speed to 186,000 miles per second and came back and shyly told Brad. Brad said "Bah! We'll be 70 years reaching the Big Dipper! Faster!" "But nothing can't go any faster!" protested Ugh. "According to Einstein—"
"To hell with Einstein!" roared Brad. "Is he paying your salary?" The ship sped onward—unless it was upward—to fulfill its Mission. Again and again Brad found himself wondering where he was going. The Mission was a real stiff. He knew only that since there was practically no life anywhere in the solar system, except for good, kind, old Earth—Earth had seen to that—anyone attacking Earth—or not doing so—was obviously somewhere in outer space! But here the trail ended. Courage, he told himself, courage! After all, was he not the grandson of Pierre Fromage, inventor of the rubberband motor? With a start, he realized he was not. His own heritage, while covered with peculiar glory, was a more tragic one—the spacemen's heritage. The Broadshoulders were brave, but things happened to them. His grandfather, a traffic officer, had chased a comet for speeding, and had, unfortunately, overtaken it. His father had been spared the fire, but one day, aboard his spaceship, someone spilled a glass of water. The gravity was off at the time, and the water just hung there in mid-air until Brad's father walked into it and drowned. What would be his own end, he wondered? What other way was there to die? Just then, through the bulkhead, he could hear Ugh swinging in his hammock, playing the violin. He wondered if the rats were dancing, like the last time he'd surprised him. Another thought was on the way, something about rats and a new way to die, but Brad was already asleep, mercifully having a nightmare. IT was morning of the fifth day when the Emergency Alarm (E-A) was suddenly activated! Instantly, a host of automatic devices went off. One turned on the fan, another blew the fuses, a third made the beds. Bells clanged and bugles sounded every call from Battle Stations (B-S) to Abandon Ship (J-r). Brad and Ugh slept through it all. Nothing was wrong, except with the Emergency Alarm (E-A). It wore itself out and the eventful voyage continued. Brad woke on the ninth day. The 2-day pill he'd taken on the third day had evidently done its work well. He was rested, he felt optimistic again. When he looked out the porthole, he could see plenty of space for improvement. There, half obscured in a tumbling, swirling mass of misty gray clouds, he could make out something white! He pressed his nose against the porthole and strained his eyes. It gave him the feeling of peering into a Bendix, as is the custom of spacemen. His mouth went damp-dry. This was it—whatever it was! "Ugh!" he shouted, all agog. "Ugh! Ugh!" Ugh dashed in, wheeling a large kaleidoscope. Expertly, they read the directions and trained it on the mysterious formation. The Indicator turned pale. "By the ring-tailed dog star of Sirius!" barked Brad. "Why, it's nothing more than an enormous gallstone, revolving in space!" "This is Sirius!" barked Ugh. "That's what I barked!" snapped Brad. "And don't ask me whose it is! It's big enough to support life, that's the main issue! Prepare to land!" A strange, yet resplendent, civilization, thought Brad, looking out at a sunlit landscape, or gallscape, of molten gold. The houses, stylish igloos and mosques, were sturdily constructed of 3-ply cardboard and driftwood. Before each house, mysteriously, stood a Berber pole of solid peppermint. Brad and Ugh bounded out of their ship. The two bounders stood there, encased in heat-resistant pyrex pants, expecting the natives to make things hot for them. Dumbfounded at the delay, they waited for the attack to commence. It did not. "I never!" said Brad, presently. "If we needed proof, we've got it! Such a display of indolence is testimony enough that these people are responsible for not attacking Earth! We shall have to use stratemegy!" Swiftly, he took off his pants, revealing underneath the red flannel costume of a 17th century French courtier, complete with powdered wig and Falstaff. Ugh ran up a flag emblazoned with the legend: Diplomacy And Agriculture, then planted beans all around the ship, while Brad postured and danced the minuet. The clever scheme worked beautifully. Soon an old man began circling them on a bicycle, keeping a safe distance. Clearly, he was someone of importance, for his long white beard was carefully braided and coiled in a delivery basket on the handlebars. Furthermore, he wore a glowing circlet on his forehead—so that Brad knew he was able to read their minds—if they had any. "How about throwing us a couple circlets?" Brad cried. Instead, the old man, who was hard of hearing, flung them a couple cutlets, which worked even better, and had protein besides. Thus fortified, they were escorted to the palace. SOME moments earlier, Brad had learned first, that Kruvny was the name of this unusual culture, and second, that the High Kruv himself, attended by all his nobles, would see him. Brad had then entered the Kruv Chamber, or Trapeze Room, and he had learned nothing since. It was all true, he told himself. The High Kruv was hanging by his toes from a trapeze, and so were all his nobles. 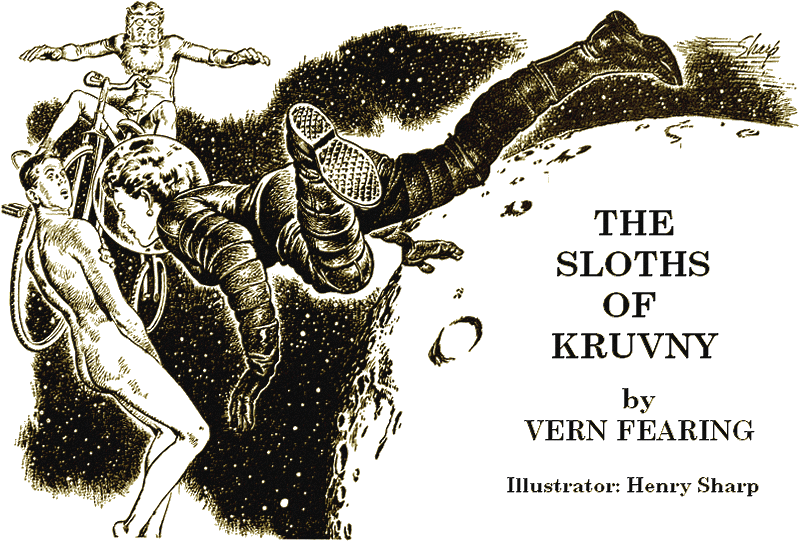 The only difference was that the High Kruv's trapeze was more ornate than the rest. Yes, said Brad to himself, it was all true; he had been shaking and punching his head, and nothing had changed. "I come," he said, "from a far away land—"
"Shad-dap!" cried the Kruv. "Who cares?" At this, the old man, who was still on his bicycle, whispered to Brad. "They've all got headaches," he nodded, stroking his beard sagebrushly. "It's all part of a great cosmic error—a tragedy played among the spiral nebulae, to the hollow ringing laughter of the gods! 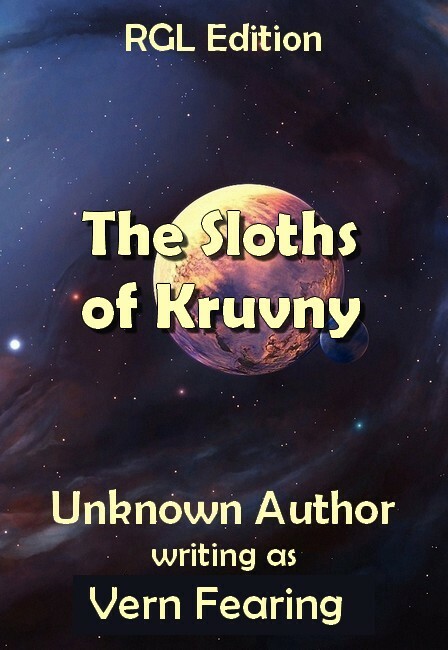 You see, we Sloths are only half the population of Kruvny," he went on. "On the other side of our world live the Sidemen, or Sad Sax. Legend has it that eons ago, the Sidemen were mistakenly delivered a cargo of saxophones, from Saks Fifth Avenue." The old man's voice was hushed as he added, "They have been practicing ever since." "I see," said Brad. "And that accounts for the headaches here?" "Small wonder," said the old man. "I bless the day I went deaf." "But why do they do it?" asked Brad. "The Sidemen? They're tryin' to drive us off'n the ranch—the planet, I mean. Yuh see, they claim they made this whole durned gallstone theirselves!" "Made it?" asked Brad, dully. "Uh-huh." The old man spat Mercurian tobacco juice. "Just like on Earth, where myriad minute oceanic organisms pile their skeletons to form coral islands. Yuh see, the Sidemen eat radishes—love 'em, in fact—but it gives 'em gallstones. They claim this whole world is the collected gallstones of their ancestors." The old man wiped Mercurian tobacco juice from his beard and shoes. "Kind of a hard claim to beat," he opined. "I see," said Brad. "That explains the misty swirling clouds all around this planet, and why it's seldom visible. You follow me?" "Yep," said the old man. "It's gas. Them radishes'll turn on you every time!" Suddenly the High Kruv began to sob. "Now you see, don't you, why we haven't attacked Earth? A body can't keep his mind on anything around here! I asked for a few secret weapons, and what did I get?" He was blubbering now. "Oh, I tried, I tried! Appropriations and all that; you may be sure we lined our pockets—but after years of stalling, they showed up with two weapons they swore were terrible enough to put an end to war. One of them was a water pistol." "I see," said Brad. "And the other?" Brad's eyes brightened. "A ray gun? May I see how it works?" A platoon of maroon dragoons dragged in a queer apparatus. It looked like a medieval cannon, with a Victorian phonograph speaker flaring from its business end. The dragoons ranged around the weapon, keeping their backs to it. One of them clutched the firing lanyard. There was a pause, a brittle silence—then the lanyard snapped! "'Ray!'" shouted the ray gun. "What was that?" asked Brad. Twice more the lanyard snapped. The ray gun boomed: "'Ray! Ray!'" "You mean all it does is shout 'Ray?'" asked Brad. "Well, it can also shout 'Max'," said the old man. "Fearful, ain't it?" "Yes," said Brad. 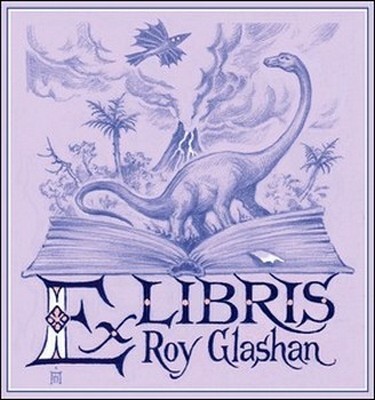 He took a piece of old parchment from a breast pocket. "This," he stated, "is the original deed to Manhattan. Notice here on the bottom where it says $24. I am signing it over to you." He signed with a flourish. "Now you have a legal claim, a crusade, and a nice piece of property. Go get it!" "But the headaches!" cried the old man. "Cool, man, cool!" said Brad. "I'll mix a Bromo." "Is it habit-forming?" cried the High Kruv. "Not a bit," said Brad, mixing it. "Simply take one an hour, forever. And now I must bid you farewell." "Wait!" cried the Kruv. "Don't you want to take my lovely daughter back with you?" Brad looked at her. She was lovely. She had scales, but she was lovely. She had magnificent blonde hair, some of it almost an inch long, none of it on her head, but she was lovely. "... Well," said Brad, hesitatingly. He had his eyes glued on her; when he took them off, they made a noise like vacuum cups: "Pfffopp!" "Your mother won't like her," whispered Ugh. "... Well," said Brad. He could feel Duty tugging inside. Not for him the pipe and slippers. He was one of spaceway's men; he would go the spacemen's way, off into waymen's space. Waymen, not women, he told himself sternly. The call of the Ether... the vacuous void... the black velvet wastes... the outspread cloak of the universe, dripping with stardust... the undreamt-of galaxies... these were the things by which he lived. "... Well," said Brad. "C'mon," said Ugh. "We'll only fight over her." Slowly, they bounded back to their spaceship. The ship sped backward, headed for Earth. It was days before the mistake was discovered, and this alone spared their lives. For had they completed their journey on schedule—but why be morbid? The fact is, the Earth blew up. What a sight. The whole thing, whirling one minute like the globe in Miss Fogarty's geography supply closet—the next minute, whamo! "Gee," said Ugh, soberly. "Guess we're lucky, huh?" "... Well," said Brad. He hadn't said anything else for days, but he didn't seem well at all. Funny, he thought. They promise you if you go on working, work hard and don't fool around, don't ask questions, just do your job, everything'll come your way. The next thing they're all dead, and there's nobody to complain to, even. Was it selfish to think of one's career at a time like this? No, he told himself. It was all he knew. The Patrol was all that mattered! He did some rapid calculation. They were far off the interplanetary travel lanes; their fuel supply was down to a single can of kerosene; food for perhaps 2 days remained. As he listened to Ugh tuning his violin, scarcely audible over the squeakings and squealings that filled the spaceship, he realized that the only solution—the only thing that could save them, or the future of Earthmen—was for a shipload of beautiful dames to rescue them within the next 36 hours. He figured the odds against this to be fifty billion to one—but Brad had fought big odds before.